Gift Card Granny conducted its annual survey to determine the latest gift card trends for 2017. 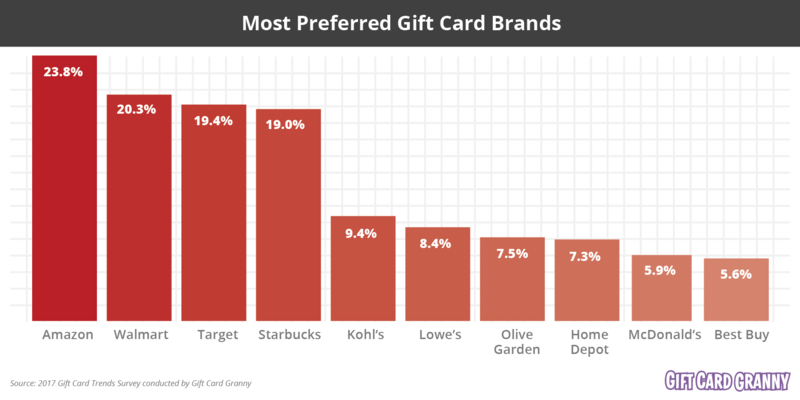 Learn which gift cards are the most popular, how much digital gift cards are growing and top online retailers for the holiday season. 39.7% of respondents stated they plan to shop at Amazon this holiday season. Nearly 24% of respondents named Amazon as a gift card they frequently purchase. Other popular online retailers include Walmart, Target, eBay and Starbucks. The digital gift card trend is continuing to rise. 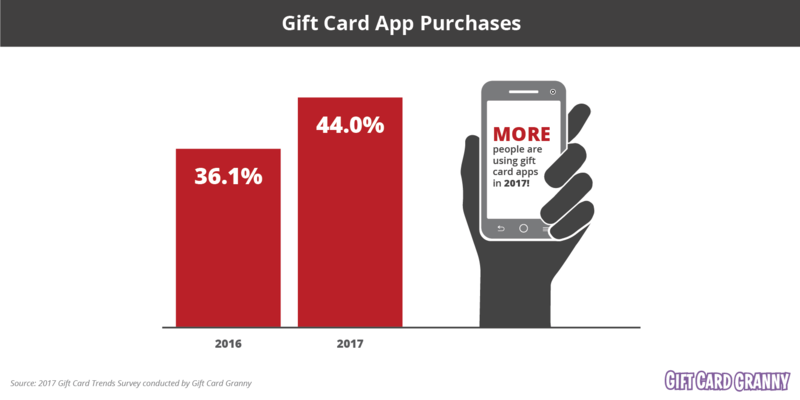 This year, 44.0% of respondents have purchased a gift card through an app compared to 36.1% in 2016. People purchasing gift cards for rewards points or cash has increased by 12.4% since 2016. Amazon rose in popularity claiming the number one spot for most purchased gift cards in 2017. Nearly 24% of respondents named Amazon as a gift card they frequently purchase. Walmart, Target and Starbucks trail closely behind as other favorites. Amazon bumped Walmart out of the number one spot this year among respondents. The Home Depot jumped from number two down to number eight in terms of popularity. Countless online retailers are available for holiday shopping needs. But with so many options, which stores take the cake? 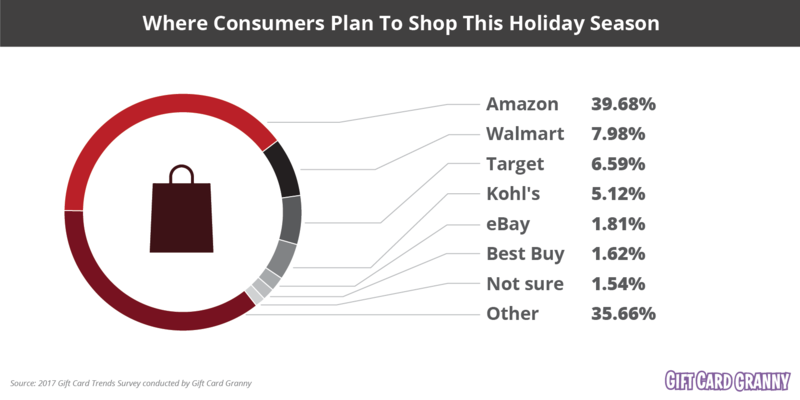 39.7% of respondents plan to include Amazon when shopping this holiday season. Other popular online retailers include Walmart, Target, Kohl's, eBay and Starbucks. The digital gift card trend is continuing to rise. This year, 44% of respondents have purchased a gift card through an app. This is an increase of 22% compared to 36.1% app users in 2016. 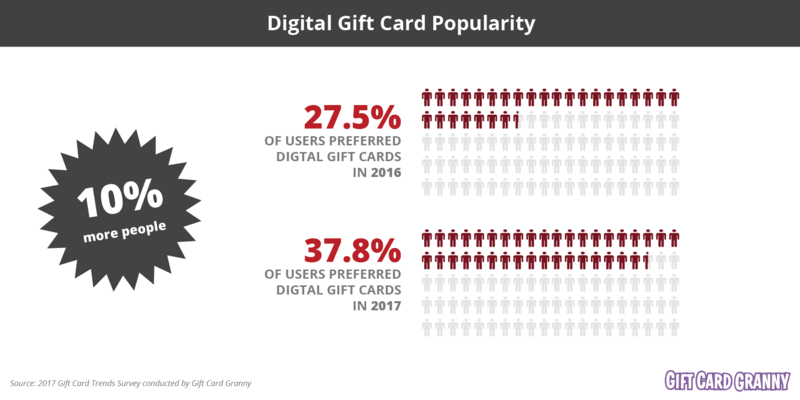 Additionally, 37.8% of people prefer digital gift cards over the 27.5% when surveyed in 2016. Gift cards aren’t just used for gifts. There’s a growing trend of people buying gift cards as a way to save. People purchasing gift cards for rewards points or cash has increased by 12.4% year over year. This is likely due to retailers offering special promotions or bonus gift cards with a purchase. While respondents are buying fewer gift cards for themselves, they’re feeling generous towards others. This year people purchase an average of 1.52 gift cards a month versus last year’s 1.22 a month. Whether the respondent is purchasing for personal use or someone else, the gift card value has slightly decreased when compared to 2016. 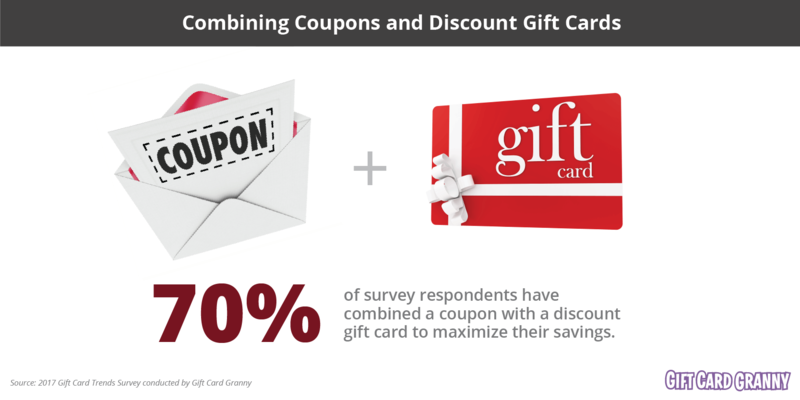 70% of respondents said they have combined coupons and discount gift cards. The average combined value of cards that respondents currently own is $104.78, down 37.5% from $144.04 in 2016. Additionally, there’s an increase of 7% of people reporting a lost gift card. Full survey PDF results can be found by clicking here. For press inquiries or more information about Gift Card Granny, visit the press and media page or email pr@giftcardgranny.com.